There is no limit to the design possibilities using coloured glass. Typically used for splashbacks and work surfaces, coloured glass provides a stylish and contemporary look which will transform the appearance of any kitchen, bathroom, reception, the uses are endless! Recent installation of dark grey splashback with cut outs for sockets. After this picture was taken we ccrewed the chrome sockets back on giving a pristine clean-cut modern-looking finish. Coloured glass is often used as an alternative to tiles. Glass splashbacks require no grouting, which means no more unsightly discoloured grout, and are easy to clean, creating a sleek modern look. It is easy to fit by securely bonding to the wall with special adhesive. What thickness of glass is used? 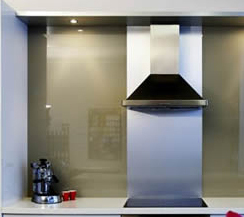 Typically glass splashbacks are manufactured in 6mm toughened safety glass. This is resistant to heat and impact. 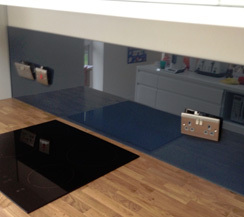 Work surfaces however are produced in 19mm toughened safety glass. Cut-outs can be produced for plug sockets, switches, hobs, sinks and basins and all splashbacks and work tops are finished with polished edges. Why use a low-iron glass? We use a low-iron glass - either Pilkington Opti-white or Diamant from Saint-Gobain - as this is more optically clear than normal glass. It provides a clearer definition of the colour chosen, as normal clear glass has an inherent green characteristic which becomes more pronounced, the thicker the glass. 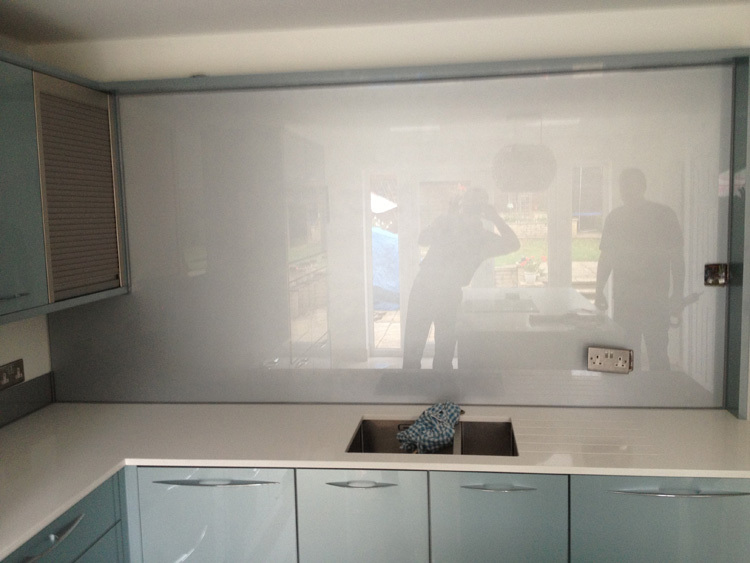 This is particularly important if splashbacks need to match the thicker work surfaces in a kitchen for example. Both thicknesses of glass have a different iron content if using normal clear glass, so the 19mm will appear greener, in turn affecting the paint colour. This issue is drastically reduced when using low-iron glass, rendering both thicknesses almost the same colour when painted. How is coloured glass produced? 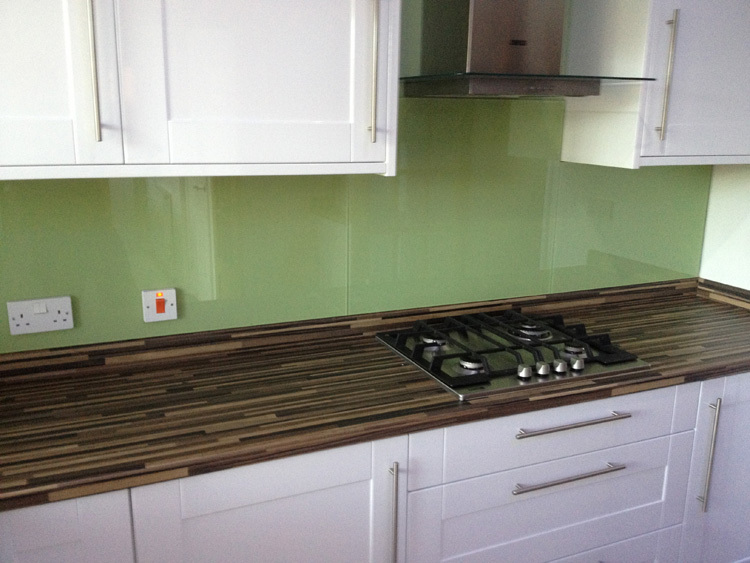 All glass splash backs and worktops are manufactured to order. The colour is spray painted onto the back of the glass, with a paint especially made to bond to the glass so it will not peel or flake. We can mix up thousands of colours including all RAL, British Standard and Dulux colours. We also offer a bespoke colour mixing service, so there is no colour we can not match! For a free quotation please contact us with your requirements.